Greetings! I am an avid Viking Reenactor looking to improve my combat kit. I fight in an organization called the Adrian Empire, where Rebated steel combat (ACL style, but larger time frame) is a tier of combat that I'm striving to get geared up for. My primary time period of focus is the Late Viking age (Knut The Great to Harold Godwinsson) Anglo-Danish Huscarls, with some interest in the Varangian Guard. But enough about me, let's get to the purpose of this post: Gear! First, I was wondering if, by the time of Halold Godwinsson, the spangenhelm had been predominantly phased out in favor of the single piece dome typified by representations of the Norman Invaders? In regards to the Varangians, would they have replaced their native helm styles with the "Phrygian Cap" style helms used by the Byzantines? Another sticking point is leg/arm and hand protection. Armoured combat requires arm, hand and leg protection be used and I was wondering if there are any examples of such that I can mimic? I've pretty much just resigned myself to using splint style armor on my legs and arms, but is there anything period that I can use for hands? All I can find the Visby gauntlets, but that's a few centuries too late for my tastes. Any help that you guys can render would be much appreciated. This illuminated manuscript from a work by John Skylitzes (11th century) shows Varangians armed and with helmets (according to wikipedia). The question is off course whether the manuscript depicts reality. They are not Varangians. 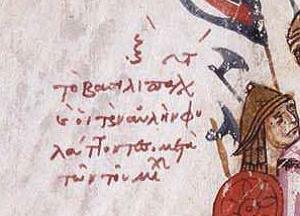 There is only one likely image of a Varangian and he is depicted barchested. We don't have the faintest idea what armour Varangians wore but mail is more likely than anything else. Thanks for the correction Dan. A bare chested image is interesting. I suppose it is the 2-handed Dane Axe that makes for the identification (and perhaps the sword as well)? 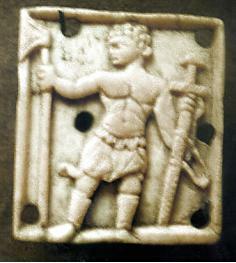 The big question is next whether it is reality OR a Roman/Byzantine "artistic/literary type" of the archetypical barbarian warrior fighting bare chested. Doesn't matter. If he isn't a Varangian then my point still stands about us not knowing what armour they wore. We don't know which battle that is depicting. I can't recall anything like this but it would really help if she does describe Varangian equipment. It's worth noting the Biblioteca Nacional de España assigns the manuscript a 12th century dating, and origin in Sicily. 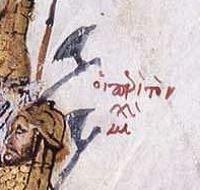 The armor related images have been cropped and saved on Manuscript Miniatures. I suspect the attribution of these soldiers as "Varangians" is based solely on the fact they are equipped with "Danish" axes. But what of this fellow? 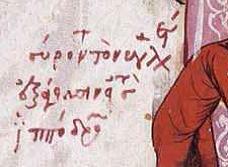 If any of you can translate the Greek rubricated captions of the picture, it might provide some clues. I'm pretty sure that is depicting some legendary Biblical act as I've stumbled into a large number of images portraying essentially the same thing. Being familiar with the idea of axe wielders as shock troops the first time I found one I thought to myself "Whoah! Dane axes were used in siege warfare to open castle gates?!" but then I found way too many similar scenes across too many centuries. Still an interesting reference point though and clearly culturally significant. This might apply for regular troops. We know that Byzantine officers and anyone else with the means wore mail, preferably Frankish mail. Varangians were paid well enough to afford any kind of armour they wanted. Why would they settle on inferior armour when they could have mail? the varangian guard i believe was actually part of the biggest one, the great companions, that means a bounty of 16 pounds of gold to just get in..
i dont know how much a shirt of mail cost but i suspect someone capable of scrounging together that much cash probably had enough to buy a shirt of mail and a helmet back home in addition to also having a decent level of quality for their weapons. and as you point out mail was so ubiquitous even among the imperial forces itself that they wouldnt see any need to add extra armour. cosidering that mail was perfectly fine for medium strength byzantine native cavalry as well, for heavy infantry to have all mail was probably pretty good level of protection. New question. Scrounging about the internet for maille rings ('cause a finished hauberk is beyond my price range) I've found both flat cross section rings and round cross section rings. As both are dome rivets, is there one type that is more historically accurate for the Viking Age, or is it simply a fabrication created by two different modern production techniques.